In Egypt the archaeologists are on strike. So are a great many other workers. Revolution is about speed – in 18 days a 30-year-old dictatorship collapses. But it's also about turning the world upside down – or from the standpoint of human freedom, right side up. And when you do that, chunks of the past, as well as of the future, come tumbling out. The ouster of Mubarak is seen as the downfall of a pharaoh, and how could it be otherwise in a country as burdened with history as Egypt. Tradition departs from its normally conservative role, suddenly aroused by an electric jolt. 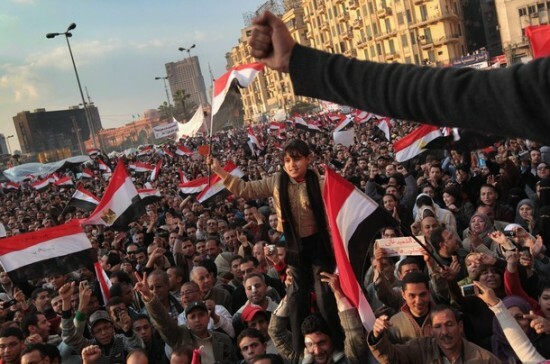 History produces a delirious joy – in Tahrir Square on the announcement of Mubarak's resignation – when you have the power to make history yourself. In passing the protestors buried not only a dictatorship but also a thesis, about the supposed “end of history”: nothing disproves that thesis so much as the deep passion, so deep it can outlast a half-century of suppression, of the objects of history to become its subjects. And this seems to be true even of the archaeologists, official custodians of all that ancient past. Is there a hieroglyph for strike? But sometimes affixing a label might also come out of an impulse to limit and foreclose what is still an ongoing process. The dominant narrative in the mass media is that this is a “people's revolution” – leaderless, ideology-less, socially amorphous, but whose leading elements are from the educated middle class, denizens of the brave new world wrought by Facebook and Twitter. This all plays nicely to Western mainstream public opinion, especially the social media angle – a revolution full of heartfelt sentiments about 'democracy' and 'humanity' led by Arab versions of Mark Zuckerberg. But this exclusive focus on immediate tactics bespeaks the almost total exclusion of any political strategy. The latter exists only as a lowest-common-denominator – down with the dictator. This suits a revolutionary movement groping to find its bearings through a haze of good intentions. Given the heavy-handed political suppression of the Mubarak years, it was almost inevitable that when a revolutionary explosion finally came, it would take an amorphous form. But nothing is more misguided than to turn this necessity into a virtue. The slogans and rallying cries of Tahrir Square will quickly become empty truisms that cannot sustain the revolution if the latter is going to realize the aspirations of the masses. Revolutions can only survive if they move forward, and this one can only move forward if it becomes a movement, not of Facebook users with their 198-method manuals, but of the many millions of workers too poor to be 'wired' but hungry to make their own history. For them, what began on January 25 is the prelude rather than the fulfilment of the revolution. But these are not the only voices vying to define the nature of freedom. Egyptian workers are also making themselves heard. It was their strike wave that gave the final push to force Mubarak over the edge. 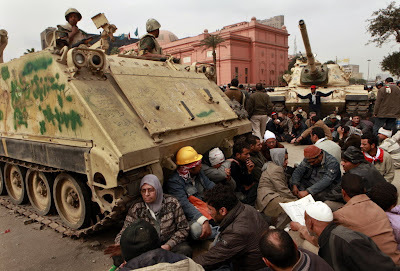 And after his ouster, instead of packing up and going home like the protestors in Tahrir Square, the workers have expanded their strikes, despite repeated threats from the new military junta running the country. Underlying this militancy is a classic case of the socioeconomic upheavals attendant on capitalist globalization: large-scale privatization by the Mubarak regime of state industries in the last two decades, a huge influx of global capital, and an exponential growth of social inequality, with a privileged layer tied to the regime growing fabulously wealthy while 40 percent of the population lives on $2 a day and a vast pool of young people are shut out of any prospects for jobs or a decent future of any kind. Add a big spike in food prices to this combustible mix and you have the conditions for a social explosion. By contrast the working class fights over issues like better wages, working conditions and pensions, greater control over the workplace and the firing of abusive or corrupt managers – in other words, economic demands that have the appearance of narrow self-interest. But this appearance is deceiving: the 'self-interest' of the working class is really the interest of all the oppressed, which is to say the great majority of the nation. To their bourgeois 'betters', the working class always seems like a 'special interest group' that threatens their freedom – including and especially the freedom to keep and expand their wealth. But what the working class fights for is freedom from social and economic oppression, freedom from poverty and misery, and without that, none of the hopes for democracy, an end to corruption and respect for human rights can ever be truly realized. It's time to make use of some ideas that have grown dusty with disuse, now that we have the 'return' of history. First and foremost is Trotsky's theory of permanent revolution. 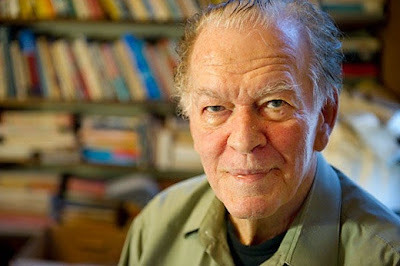 This theory is the great antidote to common sense, and nothing is more debilitating in a revolution than common sense, that rationale for the world as it is, the world that needs to be overthrown. It is common sense that first you establish democracy and later you deal with the needs of workers and the poor. But Trotsky argued – and there is a century of experience to back him up – that just the opposite is true: the working class has to become the leading force in the revolution, it has to meet its needs for social democracy (in the literal sense) and social equality, or else political democracy will end up being little more than a sham, Mubarakism with a new face. Another idea worth dusting off – world revolution. It's impossible to understand events in Egypt in a national context. Most obviously the revolution there has been part of a chain reaction of uprisings in the Middle East and North Africa – Tunisia first off, and after Egypt, Yemen, Bahrain, Libya, Jordan, Iran. The underlying economic causes – the growth of social destitution and inequality, even the recent food price hikes – are global in origin. And the tremors from these events are being felt around the world. This isn't just a matter of solidarity in an abstract sense – the oppressed everywhere are taking direct inspiration from these revolutionary struggles. 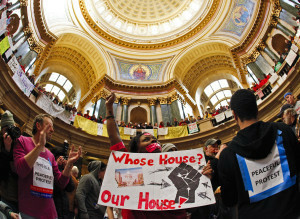 In faraway Wisconsin, USA, an ex-soldier participating in a mass union occupation of the state capitol building remarked, “I fought in Iraq and came home to Egypt.” 'Workers of the world, unite' suddenly seems like a very contemporary idea. Which suggests yet more anti-common sense: Marx and Trotsky are better guides to revolution than Gandhi. 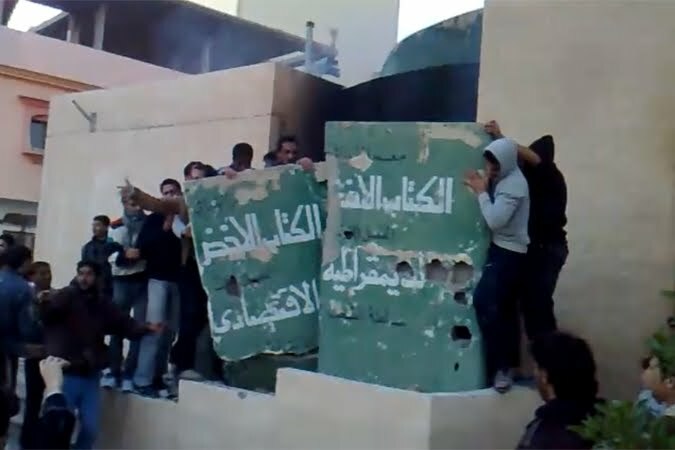 Protestors in Tobruk destroy a statue of Gaddafi's "Green Book"
But “the children” weren't listening. Instead they began conceiving of a new, more empowering relationship. According to a report on NPR, the most popular song in Egypt right now is by revered singer Mohamed Mounir called “Ezzay” (How come? ), which compares Egypt to a lover. As explained in the report, the song's message to Egypt is as follows: “I love you, and I know you love me too, but you have to appreciate what I'm doing for you. I will keep changing you until you love me as I love you.” As one would say in English, them's fighting words. The “children” have grown up. “I will keep changing you until you love me as I love you.” Even in a paraphrase in English, even without music, that has a wonderful resonance. But why stop at Egypt? If you 'globalize' this feeling, then you begin to approach the emotional appeal of socialism – the brotherhood and sisterhood of humanity. Excellent post. Hope to see more soon.